Hello Happy Site Owners! This week’s tips include a focus on the blogging tips you will need for success in 2014. It’s time to update your strategies, or get a strategy going if you don’t already have one. I’ve also got a conversion tip for you that I bet you haven’t thought of, and roundup of experts on what they think will be important in SEO this year. And for dessert, I’ve got a great tip from one of the sweetest men I know that will help you get more of your content seen on G+ in a surprising way. So let’s dive in. Listen to the podcast. Add Google Authorship option to Genesis SEO. Fix bug in search form where search term was used as placeholder text. Prevent Genesis child themes from pulling incorrect updates from WordPress.org. Fixed a couple of display and syntax errors. Recently, there have been a few high-profile posts exclaiming that content marketing is dead, or at least that it’s becoming an unsustainable strategy. In this post, Jay Bear takes on that assertion and sets it straight. And he gives what he believes are the only three ways to continue to stand out in an even bigger crowd. I’d give you the bullet points, but you really need to read the whole post to get why he picked these three. But I will say this. You do need to get strategic about it. And I’ve got a collection of more tips here to help you do that. Creating content. It’s the number one challenge to all bloggers. But successful blogging takes more than mere creation of content. It also requires a content strategy and then properly marketing what you’ve created. Selena Waite breaks down the differences and gives practical, actionable tips in this post that is featured on the ISOOSI Research Engine. And while you’re there, you may just want to check out what ISOOSI is all about and how to submit your site to the directory. Rachel Foster asks an excellent question and provides her insights in this post on the Content Marketing Institute blog. And I have to agree with her that original content should always be the cornerstone of your content marketing strategy. It’s your voice that folks latch on to. That’s also true here on Tips Tuesday, which is mostly curated content with my additions. Rachel also gives several examples of how curated content can lead to increased conversions. That’s also true here on Tips Tuesday. – Too much focus on the company’s perspective rather than the buyer’s. – No call to action. – Not taking ownership of expertise. – Not targeted to a specific audience. You’ll want to go read this article for the particulars, and get on their RSS feed or such to see more in this series, like how to create an editorial calendar. But if you want an editorial calendar right now, see this post by Jamie Griffiths on the Convince and Convert blog. He even gives you a free template to start with, and bunches of tips on how to fill it up and use it throughout the year. And here’s another way to think about your editorial calendar. It will help you locate your old posts. Amanda DiSilvestro is one of my fave bloggers and in this post she gives three tips for How to Deal with Outdated Content on Your Website. They are redirect, update, and delete, and you need to read the full post because each one has perks and caveats. And she gives you tips on ways to identify what content can benefit from each way. I’d like to add some things to consider as well. 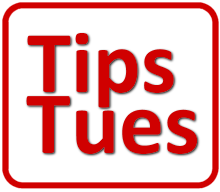 In past Tips Tuesdays I’ve shared several posts about how folks are repurposing their old content. Mainly it was a way to take advantage of Google’s freshness algorithm. So, this year, perhaps you can think about adding content in such a way that it remains evergreen via updates. You’ll probably want to do that on topics you know are going to get a lot of traffic. Be careful how you title it. And, you might need to consider putting a “last updated” notice at the top, especially if the publish date shows in your byline. This is particularly good for guides or how to posts. I’m currently doing a lot of research right now about all the code that microdata outputs about last modified too, so there’s more to it than what I’ve highlighted here. +Mike Alton is one of my fave people. Period. He is also one of my fave bloggers. And this post is the crème-de-la-crème of him telling us how he does it. I’ll be pouring over this post all week and highly suggest you do too. Images can play such a big role in getting your content noticed on social media. +Peg Fitzpatrick has a nice post on G+ with a list of sites that offer free images for you to use on your blog. The nice thing about this list is that these sites are safe and won’t put nasty malware things on your computer when you visit or download. But, one thing you need to keep in mind about any free image site is that you will be required to give proper attribution, meaning a link back to the source. That’s the price you pay for free. You’ll want to read the Terms of Service on each site to see if they require a dofollow link. If not, then consider using a nofollow link, to protect your SEO. If you don’t want to use any attribution link, then consider either purchasing images from sites like iStock and others, or even taking your own. Can Small Changes Make a Big Difference for Website Conversions? On the Higher Visibility blog, Amanda DiSilvestro asked several of the experts I follow what’s going to be important in 2014. I wasn’t surprised to see so many of them say creating long-form content would be at the top of the list. That’s about 1500-2000 word posts. Now, I’m delighted about that because I write so many tutorials. But if you don’t, another big trend is telling stories. Those are a great way to inform and entertain your audience and endear them to you. For dessert this week, this is one of the best G+ tips I’ve seen in a while from one of the sweetest men I know. Just go take a look at how +Stephan Hovnanian is using the Story section of his About tab in his G+ profile. In fact, look at how he’s doing everything on his profile. I have Stephan in a Circle labeled Gurus for a reason.